Lifted Life V-Neck T-Shirt (Women’s) 100% cotton, preshrunk. “FADED” - Lifted Life T-shirt (Men’s) 100% cotton preshrunk. “COILOVER” - Lifted Life T-shirt (Men’s) 100% cotton preshrunk. “DO IT BIG” - Lifted Life T-shirt (Men’s) 100% cotton preshrunk. “LIFESTYLE” - Lifted Life T-shirt (Men’s) 100% cotton preshrunk. Description: “CHAIN LINK” - Lifted Life T-shirt (Men’s) 100% cotton preshrunk. 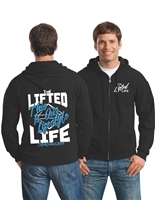 Lifted Life Pullover Hoodie (Women’s) 100% cotton, preshrunk. 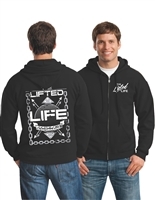 Lifted Life Zipper Hoodie (Women’s) 100% cotton, preshrunk. Description: “DO IT BIG” - Lifted Life Zip Up Hoodie (Men’s) 100% cotton preshrunk. Description: “COILOVER” - Lifted Life Zip Up Hoodie (Men’s) 100% cotton preshrunk. Description: “FADED” - Lifted Life Zip Up Hoodie (Men’s) 100% cotton preshrunk. Description: “CHAIN LINK” - Lifted Life Zip Up Hoodie (Men’s) 100% cotton preshrunk. Description: “LIFESTYLE” - Lifted Life Zip Up Hoodie (Men’s) 100% cotton preshrunk. Description: “FADED” - Lifted Life Pull Over Hoodie (Men’s) 100% cotton preshrunk. Description: “CHAIN LINK” - Lifted Life Pull Over Hoodie (Men’s) 100% cotton preshrunk. "LIFESTYLE” - Lifted Life Pull Over Hoodie (Men’s) 100% cotton preshrunk. "DO IT BIG” - Lifted Life Pull Over Hoodie (Men’s) 100% cotton preshrunk. “COILOVER” - Lifted Life Zip Up Hoodie (Men’s) 100% cotton preshrunk.